How to install or replace your Dishwasher Water Line? Installing a dishwasher line for the first time is basically the same as installing your newly bought dishwasher. As you can see, the dishwasher line provides the clean water the appliance uses to wash dirty dishes and cutleries. You can consider the water line as the heart of your dishwasher because without it, no cleaning may be done. There are basically three connections involved in the dishwasher. These are the water supply or the dishwasher water line, the drain line where all dirty water goes, and the electrical hookup that powers the appliance. If you’re worrying about the major lines such as the water line and the drain line, it is recommended to have the dishwasher installed next to the sink. This is so you won’t need long hoses to connect the dishwasher and mostly, the connections are going to the sink where the main drain is. You can install the dishwasher water line yourself; you don’t really need to pay top dollar for a plumber. What is the step-by-step procedure for installing or replacing a dishwasher water line? Step 1: If you haven’t prepared the kitchen space for which your dishwasher will sit in comfortably for years to come, now is the time to do so. 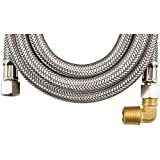 If your dishwasher is sitting pretty already, then its time to figure out the where all hoses will rest and connect. Remember, when positioning your dishwasher, think about the proximity of the appliance to the necessary inlets and outlets. You may have to drill holes through the cabinets for the dishwasher’s electric wires, water inlet, and drain tube. Step 3: Turn the water supply off before you do the connections. Otherwise they may be leaks and gushes of water everywhere. Connect the water supply hose under the sink. Make sure that you have provisions to attach the hose; otherwise, you may need to get pipes that would cater to more than one connection. You may have to ask a plumber to do it for you as replacing the pipe underneath the sink is not really for beginners. If you think you can remedy the piping, you might need a wrench to help you as well as some new tubes that can be bought from major hardware stores. Step 4: If you have a hot water supply line, connect it to the dishwasher as well by using a dual outlet valve to the hot water inlet under the sink. The dual outlet valve lets you connect hot water outlet to one side, and attach the dishwasher water supply line to the other outlet. Step 5: Connect the water supply line to the dishwasher. This will vary depending on the model and type of dishwasher you have. In most cases, dishwashers come with an installation kit that has the fitting called “dishwasher 90”. Installing this fitting is the first step before hooking the water supply line onto the dishwasher. Afterwards, connect the hose and tighten with pliers. Other methods in connecting the water supply line is to first thread some Teflon tape around the dishwasher water inlet, attaching a pipe elbow that can be bought from hardware stores if it is not included in the installation kit, and using the wench to tighten the water line onto the elbow. Step 6: Open the water line and try to operate the dishwasher to see if adequate water or hot water is pouring in. Take note that you have to first settle other major connections such as the electrical wiring as well as the drain hose before doing this. It is not safe to run the dishwasher with only one connection complete. Step 7: To replace the dishwasher water line, follow the steps above as if you are installing it for the first time. However, you may need assistance in taking off all the fittings you have previously installed, and of course use new tubing and piping where necessary. Key Takeaway: It is not really difficult to install or replace the dishwasher water line. As mentioned, you don’t need to be an expert on this, as long as you know where to find the parts, and how to fit them together. The step-by-step guide is essentially there to guide you but you may divert to modifications if needed. What are the things you will need to install or replace your dishwasher water line? Power drill with hole saw – To punch a hole in the cabinetry leading to underneath the sink; to make way for the hoses. Wench – For helping you install elbow pipes and other heavy piping and tubing. Pliers – For helping you tighten or loosen nuts. 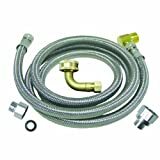 Water line and drain tubes – This is included in the installation kit of your dishwasher, but in case you need more, having these would be handy. Learning how to install or replace your dishwasher water line may come in handy in the future not only because you can be rest assured that you can do some troubleshooting during emergencies and you are saving money instead of paying it off to a plumber. Doing DIY things around the house is a good hobby as it helps you learn and do new things, especially if you are not well acquainted with it.